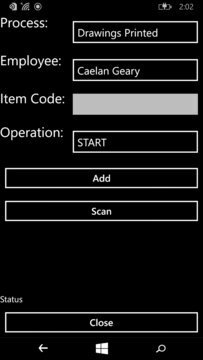 Using item barcodes and your mobile device, StruMIS Mobility allows you to update job statuses live from the workshop floor. With the ability to start, stop, complete and deliver steel members right from the mobile app, streamlining your StruM.I.S operations becomes a breeze. Because of the level of integration the StruMIS Mobility app provides, you can compare estimated costs to actual costs with a degree of accuracy never before practical. Each scan on the mobile device updates the StruM.I.S timesheets with timings accurate to the second. Contact a StruM.I.S representative for a full demonstration of the features available in the StruMIS Mobility app, and to purchase a licence. It is recommended you have Wi-Fi infrastructure already available on the workshop floor.